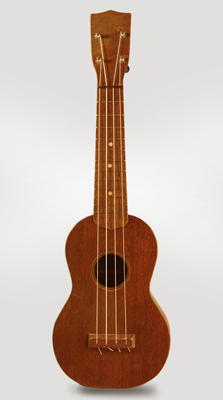 Favilla Soprano Ukulele, c. 1950, made in New York, NY, natural lacquer finish, mahogany body and neck, black chipboard case. Overall length is 20 3/4 in. (52.7 cm. ), 6 3/8 in. (16.2 cm.) wide at lower bout, and 2 1/4 in. (5.7 cm.) in depth at side, taken at the end block. Scale length is 13 1/2 in. (343 mm.). Width of nut is 1 7/16 in. (36 mm.). A very good-playing and sounding ukulele. Some light wear overall -- mostly finish flaking to the fingerboard and some dings and scrapes. No damage, modifications, or repair; the nicest old Favilla uke we have had, complete with a modern SSC. Excellent - Condition.